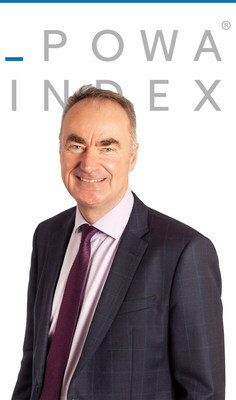 LONDON, April 3, 2019 /PRNewswire/ -- DataPOWA Ltd, the AI technology firm delivering POWA index, the world's first data-driven, real-time sports sponsorship valuation engine, is pleased to announce the appointment of Ian Penrose to the new role of Non-Executive Chairman, and he will join the company's board with immediate effect. Ian has been in leadership roles for the last 20 years in the sport, technology and gaming markets. He has been CEO of two public companies throughout this time, Sportech Plc (the global gaming technology group) and Arena Leisure Plc (the UK's leading racecourse and media group), growing both businesses significantly. Ian stepped down from Sportech at the end of 2017 and is now the Chairman of the National Football Museum, a Non-Executive Director of the FTSE 250 technology group Playtech Plc, and a strategic adviser to both Weatherbys Limited and the Alizeti Group. DataPOWA's Chief Executive, Michael Flynn, said: "It is with great pleasure that we welcome Ian Penrose to the DataPOWA Board, Ian is a well-known and respected figure within the sports sector and brings a wealth of industry knowledge, both in the UK and USA, to DataPOWA. We are delighted to appoint him Non-Executive Chairman and we look forward to his strategic expertise and board experience helping to accelerate our growth." Ian Penrose said: "I am very excited about working with Michael Flynn and the team at DataPOWA. They have bold ambitions – and I'm confident that their combined understanding of sports and digital will enable their innovative AI technology, POWA index, to become an important business in the sports sponsorship sector."